to subscribers via email every other Wednesday. Jane Friedman (@JaneFriedman) is a writer and professor with more than 15 years of experience in the publishing industry, and has expertise in digital media strategy for authors and publishers. She has served as publisher and editorial director at Writer’s Digest and digital editor for the Virginia Quarterly Review. Jane specializes in educating authors about the publishing industry, and is known for thought-provoking talks on the future of authorship. She currently teaches digital media and publishing at the University of Virginia and is a columnist for Publishers Weekly. Porter Anderson (@Porter_Anderson) is a journalist and consultant. He is Editor-in-Chief of the international site Publishing Perspectives and the former Associate Editor for The Bookseller’s The FutureBook in London. A former news anchor and producer, his Music for Writers is read at New York’s Thought Catalog. He has programmed conference events for IDPF, Writer’s Digest, Frankfurt Book Fair, The Bookseller’s Author Day, and Novelists Inc. He has worked with CNN International, CNN.com, The Village Voice, Rome’s UN World Food Programme, and Copenhagen’s INDEX. 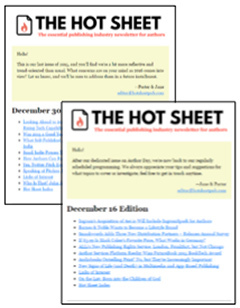 If you’re an author and want to stay on top of the important issues in the world of publishing—issues that affect you—you need The Hot Sheet. With all the chatter out there, it will help you sort through the noise with stories that focus on relevant topics from across the publishing spectrum. From author success stories to key industry statistics, you’ll find what you need to know in The Hot Sheet. This newsletter is designed to enlighten and educate (no drama, no hype) and will empower you to make informed decisions to keep your career on track.